Joint Winter/Summer Schools between UPEM and AlmaU! Director of School of Hospitality and Tourism - Mr. Azamat Auezkhanuly, Lecturer of School of Hospitality and Tourism - Mr. Dilmurat Sabirov, and Deputy Dean of Academic Affairs of School of Business- Gulmira Zhumadilova have presented the results of their mobilities through Erasmus + for the fellow Faculty and Staff members of AlmaU. 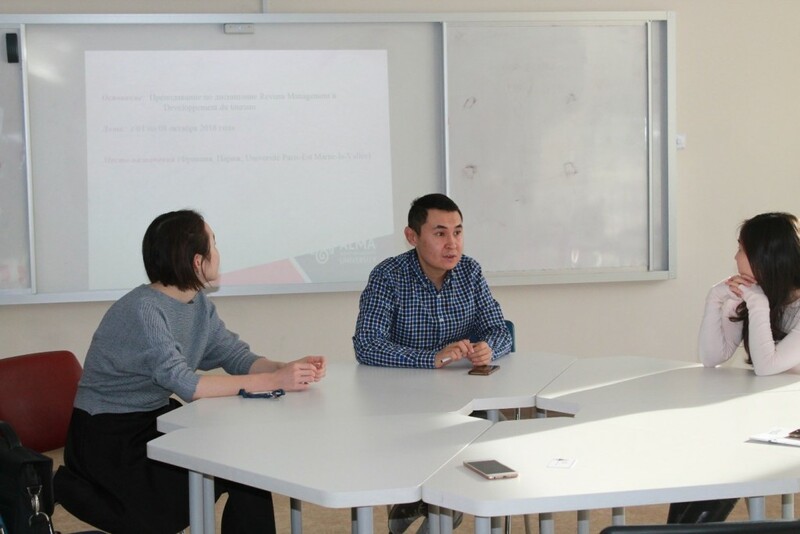 Mr. Auezkhanuly and Mr. Sabirov described how they taught lectures “Revenue Management” and “Developpement du tourism” in English and French the University of Paris-Est Marne-la-Vallée (UPEM). As we result, they have agreed with University on making joint winter/summer Schools between UPEM and AlmaU. Ms. Zumadilova shared her experience of going for a staff mobility at the Varna University of Bulgaria. The special commission considered all the applications and interviews. The final decision on the finalists is taken by the university partner and representatives of Erasmus +. Those who did not qualify this time are invited to take part in the competition for the next semester. We congratulate the winners and wish them success!